NKJV Pitt Minion Reference Bible: Black, Goatskin Leather was published by Cambridge University Press in October 2007 and is our 18030th best seller. 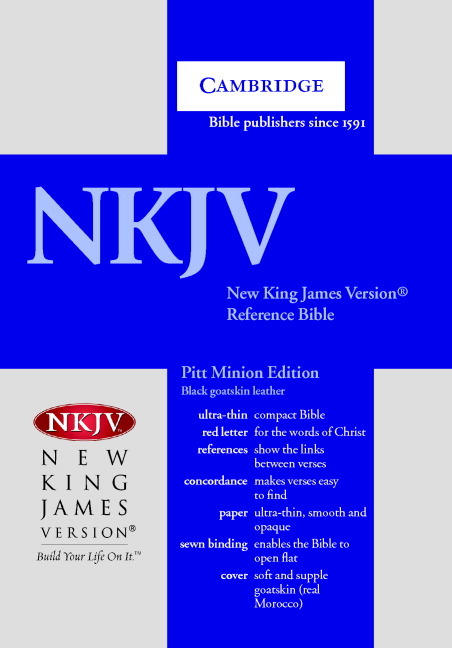 The ISBN for NKJV Pitt Minion Reference Bible: Black, Goatskin Leather is 9780521706216. This Bible is just Perfect for me. This Bible is amazing well worth the price. Would definately reccomend if you are looking for a compact yet readable Bible like I was. Got a question? No problem! Just click here to ask us about NKJV Pitt Minion Reference Bible: Black, Goatskin Leather. Does this Bible have Ribbon Markers and if so, how many does it have? What size is the text? A:This Pitt Minion edition features a 7 point font size, set in the Lexicon No.1 typeface. Does this Bible include the words of Christ in red text please? A:Yes, this edition features the words of Christ in red.